OWINGS MILLS, Md. – Junior Daniel Williams was 23-28 passing for 192 yards and two touchdowns as the No. 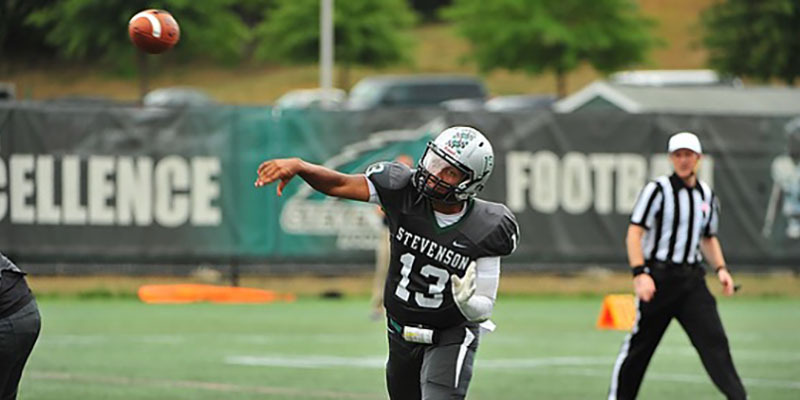 24 Stevenson University football team remained unbeaten with a 24-13 win over Lebanon Valley College in Middle Atlantic Conference action Saturday afternoon at Mustang Stadium. Stevenson (3-0, 2-0 MAC), which entered the D3football.com Top 25 for the first time in program history following last weekend, won its fifth straight game dating back to last season and won its 11th straight game in September over the last three seasons as the Mustangs open 3-0 for the fourth straight year. The hosts also won their third straight over Lebanon Valley (1-2, 1-1 MAC) and evened the all-time series at three wins apiece. Williams completed all 13 of his pass attempts in the first half as the Mustangs opened a 14-0 lead. He got Stevenson on the board with 5:53 left in the first as he completed a 30-yard touchdown pass on third-and-15 to sophomore Preston Addo to make it 7-0. Following LVC being forced to punt from its own 28, Stevenson began its ensuing drive in good position as a 30-yard punt return from Addo put his team at the Dutchmen 42. Six plays later, an eight-yard run by sophomore Jainard Crawley-Lambert made it 14-0 with 1:03 left in the first. Lebanon Valley chewed up nearly nine minutes on its next drive, running 16 plays and getting down to the Stevenson 2-yard line before the Dutchmen's Jon Jones was brought down in the backfield twice by sophomore Nicholas Kelly. Facing fourth-and-goal on the eight, LVC's Tim Pirrone's pass to Trey Manning was incomplete, with junior Mike Datu pressuring Pirrone. Stevenson took over with just under seven minutes in the first half and worked its way down to the Lebanon Valley 27. The Mustangs were unable to convert on fourth-and-1 to give the guests another chance to score before halftime. LVC got into Stevenson territory, but its drive stalled at the Mustang 36 with six seconds before halftime. Pirrone was intercepted on LVC's first drive of the second half. On third-and-7 from his own 34, Pirrone threw a ball that was tipped at the line by junior Shaviah Coleman and intercepted by senior Jimmy Lauer at the 37, giving Stevenson a takeaway for the 35th straight game. An-eight play drive was capped by Williams finding senior Kenneth Scott-Kelow in the end zone on a 10-yard completion to make it 21-0. Lebanon Valley got on the board with 1:57 left in the third as Pirrone's one-yard keeper to cap a 13-play, 66-yard drive made it 21-6, as Marcus Brown's PAT attempt was blocked by sophomore Daniel Flowe. Senior Tim Sternfeld made it 24-6 2:09 into the fourth quarter when he converted a 25-yard field goal after a 67-yard drive stalled at the Dutchmen 8. Lebanon Valley pulled within 24-13 with 6:47 left as a 15 play, 73-yard drive was capped by another run by Pirrone to make it 24-13. The guests appeared to recover an onside kick attempt, but officials ruled the ball was touched before 10 yards, giving the ball back to Stevenson. Stevenson turned it over on downs at the LVC 24 with 2:50 left, but quickly got the ball back on Lebanon Valley's second play as Kelly knocked the ball loose from Pirrone and junior Thomas Camper recovered at the 37 with 2:23 to go. Senior Devonte Williams ran out the clock with four runs for 33 yards before the Mustangs did not have to run another play. Crawley-Lambert had 14 rushes for 86 yards and a touchdown and now has five TDs in his first three games. Junior Dequan Ellison caught seven balls for 75 yards, while classmate Devin Salisbury had six grabs for 31 yards. Addo added five catches for 56 yards. Lauer led the Mustangs with nine tackles (six solo), while sophomore JT Arias also had nine stops. Sophomore Ashton Leschke finished with eight tackles. Pirrone finished 8-16 passing for 76 yards while also rushing for 106 yards on 13 carries. The Dutchmen ran the ball 52 times for 222 yards, leading to a 31:57-28:03 lead in time of possession. The Mustangs outgained Lebanon Valley 338-298 and also won the turnover battle as they did not have a giveaway on the afternoon. Stevenson plays its second straight home game next Saturday as it hosts FDU-Florham in a 1:00 Middle Atlantic Conference game at Mustang Stadium.